We moved to Thailand in April 1999. We didn't have a house yet and my 40ft container with furniture hadn't arrived either, so the company put us in an hotel on Beach road in Pattaya where I would lay in the sun while Dirk was working. I would be searching for houses or condo's during the day, but that was all I had to do the first days. I didn't have a car yet, I didn't know the language, I didn't know anybody, and for sure I had no clue about the local customs. So when we would go out at night that first week to eat dinner we had no clue what was going to happen to us... We thought: "Wow, it is really busy here on the streets!" And then the water throwing started!! We were surprised and soaked by the end of the evening. Hundreds of people on open trucks throwing water to tourists who had no clue, that is of course the most fun!! People who have no clue... like us!! This was our first introduction to the wonderful land of the Smiles! This was also the last time I moved to a country without preparing and researching!! But let me tell you a bit about how to celebrate Songkran in Thailand. On the eve of Songkran Day, i.e. on the 12Th April, the people clean their house and burn all the refuse. This is a Spring Cleaning Day done as a duty in the belief that anything bad belonging to the old year will be unlucky to the owner if left and carried on to the coming New Year. It is something like a Public Health Cleaning Day but backed by traditional belief has proved more effective to emotional people than prosaic reason. Early on the first day of Songkran, the 13Th April, the people both young and old in their new clothing go to the Wat or monastery belonging to their village or district to offer food to the monks there. A long table is erected in the compound of the Wat where monk's alms bowls stand in a row on either side of the table. Into the alms bowls the gathering people put boiled rice and into the covers of the alms bowls, food, fruits and sweetmeats. Such a performance can be seen at Wats outside Bangkok on Songkran Day. While the monks partake of their feast, music sometimes is played to celebrate the occasion. 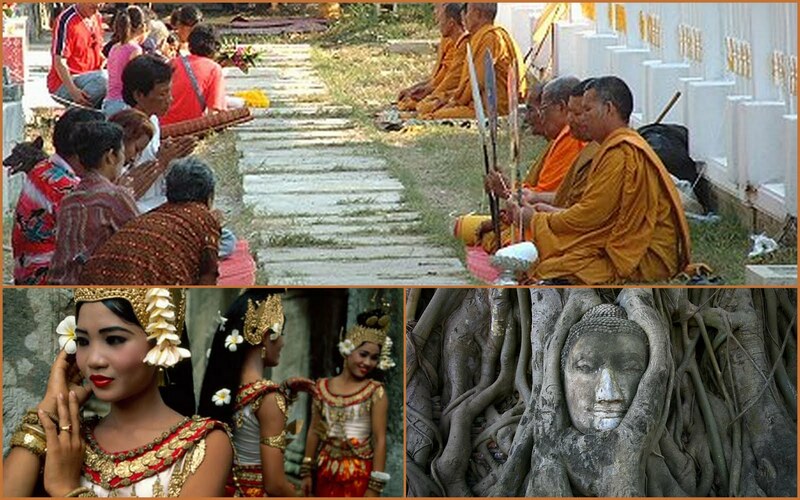 In the afternoon of the same day there is bathing ceremony of the Buddha images and also of the abbot of the Wat. After this begins the well-known "water throwing feast". The bathing of images is done as ritualistic ceremony, but it is no other than a New Year's purification. Younger people will also on this day or the succeeding days go to pay their respect to and ask blessings from their elders and respected persons. They will pour scented water into the palms of the old people and present them with a towel and other bathing requisites. In the old days it was an actual bathing where the young people helped the old people to take a bath and to change their old clothing and put on the new clothes which the young people presented them as an act of respect to the aged on the occasion of the New Year. Another duty to be done during the Songkran Festival is a religious service called Bangsakun performed in sacred memory to the dead. When a person died and was cremated, the ashes and charred bones of common people were buried at the root of a sacred fig-tree in a Wat. Such trees are to be found in the grounds of almost every Wat. It is a symbol of the Lord Buddha's enlightenment for under such a tree did Buddha sit in meditation and receive his enlightenment. If a person is able to erect a Pra Chedi or pagoda in the Wat the ashes and bones are then deposited in it. In later times a portion of the bones was sometimes kept in the house in a receptacle. On Songkran Day a religious service in sacred memory to the dead may be officiated by a monk or monks at the place where the ashes and the bones have been deposited, or as in some localities the people bring their dead bones to a village wat in company with others where a joint memorial service is performed. In some parts of the country the guardian spirits of the village and town receive also their annual offerings on Songkran Days. Obviously there are reminiscences or traces of ancestor and animistic worship in by-gone days. 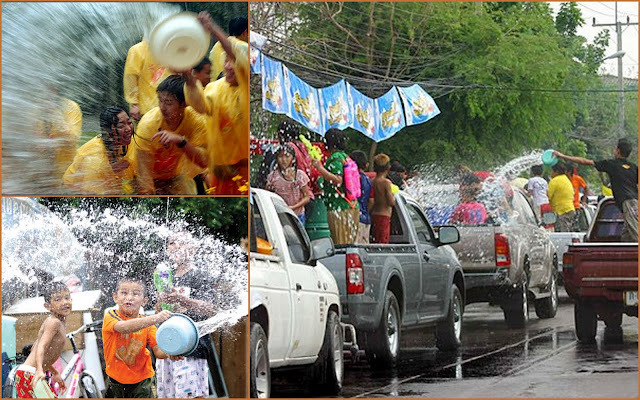 If you celebrate Songkran ~ Have a wonderful celebration! Thanks for this great explanation of Songkran day! I am bummed we missed the ceremony at the temple yesterday. All too tired after Ruby's party and family still here. But I want to do something. Maybe we will make a tradition of water play and maybe first I can stop by the temple for a blessing for Ruby. How funny you got soaked the first time and didn't know what was going on! Were you upset at first or have a good laugh??? wow how interesting, thanks for sharing and having all those great pictures! Thank you so much for sharing all your great insights into Thai culture. It's wonderful to have you as a resource. 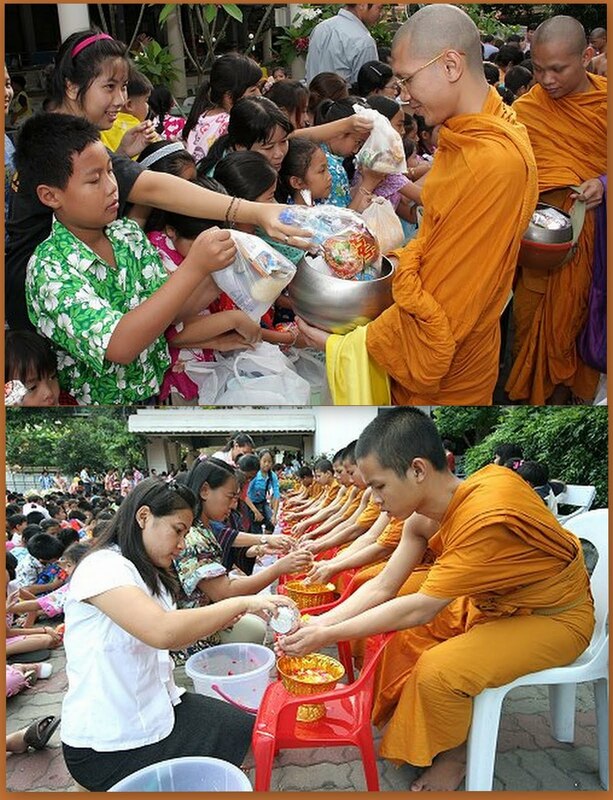 Though I knew about Songkran day, I never thought of incorporating it into our family traditions until your post today. Time to break out the water guns! Indeed I had a laugh, you can NOT laugh with all those smiling faces around you! But I went back fast to the hotel to get changed!! And yes indeed Wendy, time to get the water guns out!! FUN FUN FUN!